After you arrive at the Bangkok airport, proceed to the domestic airport for boarding your flight to Ko Samui, one of the most popular Thai Islands. On arriving, meet an IHPL representative who helps you with an assisted transfer to the hotel. Post check-in formalities, the day is at leisure wherein you can indulge in the activities of your interest. Also spelled as Kho Samui, it is a beautiful island of Thailand with a bustling tourism industry. The second largest island of the country, Ko Samui has clean pristine beaches. Stay overnight. On day 2, have your breakfast and get all set for partaking in sightseeing of the mesmerizing Ko Samui Island. The first visit of the day is to the extraordinary rock formations of Hin Ta & Hin Yai, popularly known as Grandfather and Grandmother Rocks. Later, continue towards Na-Muang Waterfalls, two fresh water falls, placed close to each other. Indulge in fun activities here. Now move to Nothan, Ko Samui's capital, to splurge in shopping. You can not only get your hands on some amazing stuff like home décor products, Thai fruits, eco-friendly beauty products, etc but can also taste some amazing lips-smacking authentic seafood delicacies. Bring your city tour to an end by visiting the very popular attraction and landmark of Big Buddha statue, a 12 m tall status made in gold in 1972. The evening is at leisure. Overnight stay. Have your breakfast. Later, get transferred to the airport to board your flight for Bangkok. An IHPL representative assists you in doing check-in at the hotel. The afternoon is scheduled for temple tour of Bangkok. Sightseeing includes the Temple of Solid Gold Buddha or Wat Traimit- housing the world's largest gold statue of seated –Buddha. Proceed driving past the China town to visit the Temple of Reclining Buddha or Wat Po- a gold plated temple, famed as the oldest one in Bangkok. 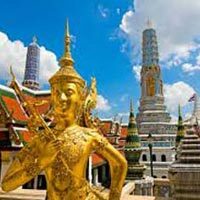 The last temple is the Wat Benchamabophit, also known as the Marble Temple-one of Bangkok's important attraction. 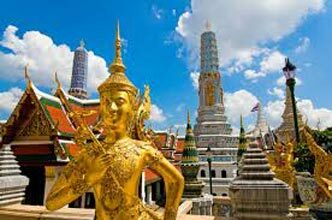 The last visit is to the Royal Palace or the Grand Palace- a complex of buildings, which is home of Bangkok's royalty since 1782. Overnight in Bangkok. 4th day after breakfast is free. Spend the day as per your own liking partake in the activities of your interest. Explore the nearby attractions on your own, interact with the locals, binge on lip-smacking local delicacies or simply relax in your hotel. In the evening, visit the popular markets to collect souvenirs for your loved ones back home. Do not miss buying clothes, imitate jewellery, accessories, electronic goods, decorative items and more. You can also visit popular shopping centers and markets including China town, Pratunam, Pantim Plaza, Chatuchak Market, Gaysorn Plaza and Sogo Department Store to splurge on shopping. Overnight in Bangkok. On the last day after breakfast, get transferred to the Bangkok Airport to board the flight for your onward journey.